Our washer and dryer are some of the most important time and money-saving appliances in your Castle Rock, Parker or south Denver metro home. Blue Frog Appliance Repair’s dedicated professional home appliance repair technicians are passionate about making sure your valuable time is spent enjoying your family and friends rather than sitting for hours in a laundromat due to a broken washer and dryer. Our appliance repair team is fully qualified to repair nearly any top laundry appliance brands, including LG, Maytag, GE, Whirlpool, Samsung, Kenmore, Kitchen Aid, Frigidaire, Amana, and many, many more! 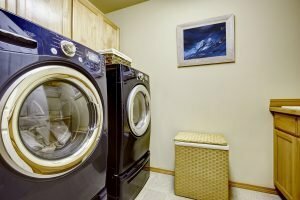 If you’re in need of laundry appliance repair services, the friendly appliance repair technicians at Blue Frog will help you with any washer or dryer appliance troubleshooting over the phone, along with a free and honest estimate for any necessary appliance repairs or appliance replacement parts needed. Don’t put up with a noisy, inefficient washer or a dryer that leaves your clothes damp—call us today before you waste any more time, money, and energy on these major inconveniences! We know that when any laundry appliance repair is needed, your daily routine is disrupted, so we do our best to provide same-day service to allow our Castle Rock, Parker, and south Denver metro clients to get back to their lives as soon as possible. Our appliance repair technicians are well-versed in appliance repairs for nearly every brand and model of laundry appliance available. We work tirelessly to obtain appliance replacement parts for your washer and dryer at the most competitive rates around. Contact Blue Frog Appliance Repair now to keep your laundry appliances energy-efficient and in tip-top shape!